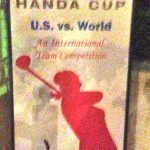 WEST POINT, MS. – The ninth playing of the Handa Cup begins Saturday at a most appropriate location. 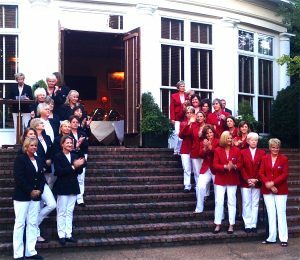 Old Waverly Golf Club is the first site used for the LPGA Legends Tour’s premier team event that had previously hosted a U.S. Women’s Open. 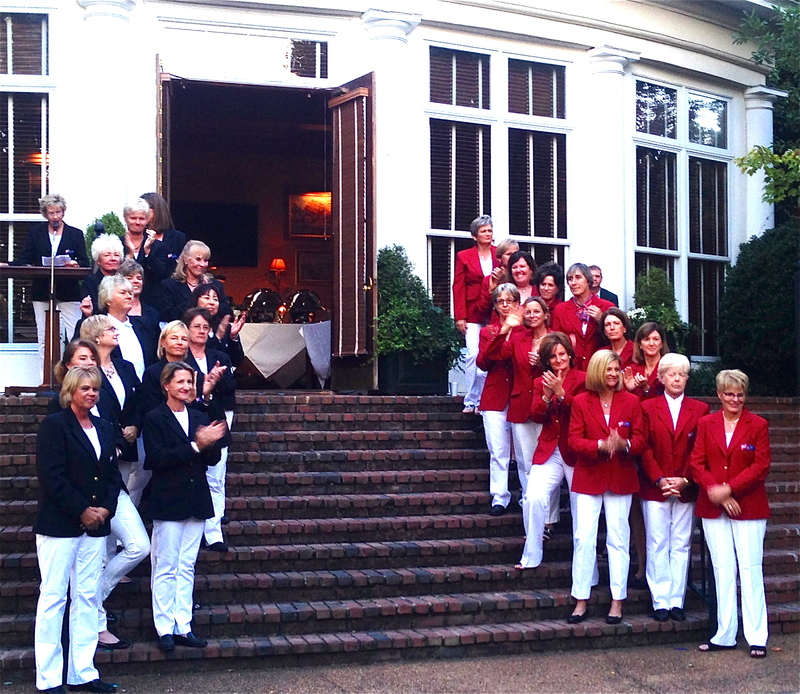 Captain Nancy Lopez gathers her U.S. team at the Handa Cup’s opening ceremonies. The club’s enthusiasm for the Handa Cup showed in the nine months leading up to the big event. 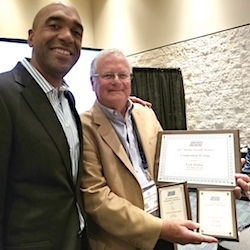 The club’s chairman, Rick Milburn, said that 111 sponsors, advertisers and contributors stepped forward and over 250 volunteers were projected to contribute over 7,000 hours to the staging of the event. “Pretty impressive for West Point, Mississippi,’’ said Bryan, who was born in West Point. 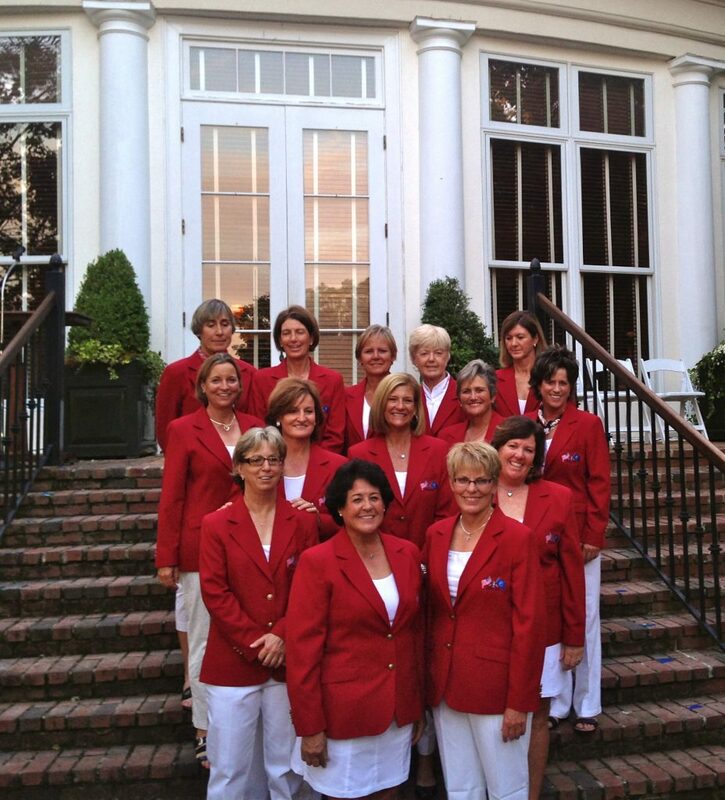 Nancy Lopez, the U.S. captain, was in the foursome that played the ceremonial first round at Old Waverly in 1988. 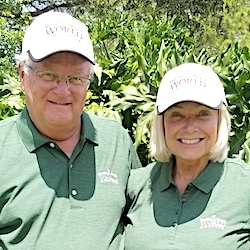 Her partners included Jerry Pate, the former U.S. Open champion who joined with Bob Cupp in the course design effort, and the late LPGA player Heather Farr. The World (in blue) and U.S. (in red) get ready for battle. 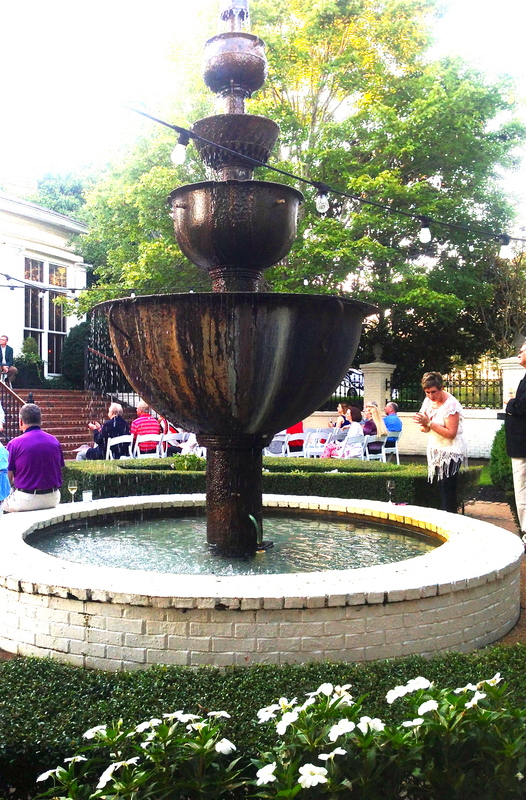 Lopez and World team captain Sally Little introduced their 12-player teams during the well-attended opening ceremonies, which were held in the club’s English Garden prior to the dinner for participants in Friday’s Blue Cross Blue Shield of Mississippi Pro-Am. Two of Lopez’ Handa Cup players finished one-two in the U.S. Women’s Open played at Old Waverly. That was an historic event on several fronts. Champion Juli Inkster posted a 16-under-par 272 score for 72 holes, which was six shots better than the previous tournament record for under-par scoring. 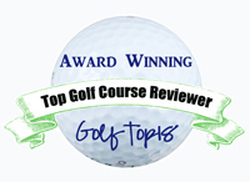 The 272 also matched the stroke total record set by Annika Sorenstam three years earlier on a par-71 course. Old Waverly was a par-72 that played a 6,421 yards for its U.S. Women’s Open. 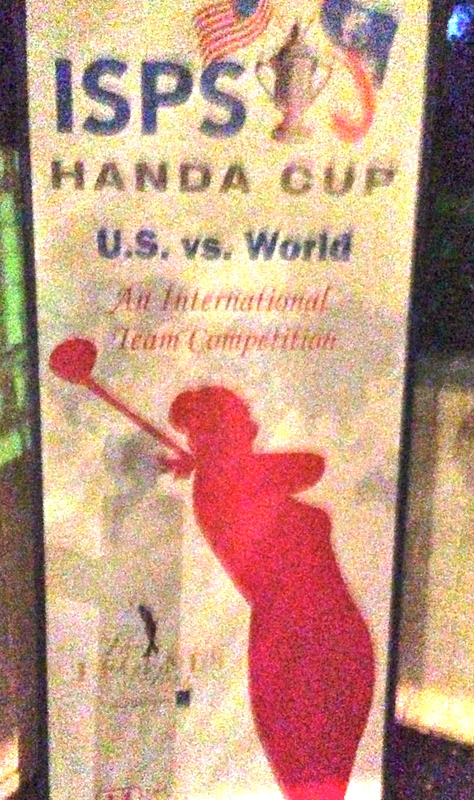 The word is out that the Handa Cup matches are a big deal. Inkster’s closest challenger was Sherri Turner, who was five strokes back. During that tournament Inkster was 38 and Turner 42, so it was a battle of veterans. Inkster was also the first American to win since Patty Sheehan five years earlier. That was Inkster’s first of two U.S. Women’s Open wins – she also was the 2002 champion – and the fourth of her seven titles in major tournaments. She would also win the LPGA Championship three weeks later. Lopez was delighted that Inkster consented to be part of her team in her debut on the Legends circuit, which welcomes players who reach their 45th birthday. Lopez expected that Inkster would have good vibes about returning to the course where she posted such a big victory. 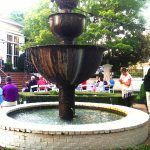 This unusual fountain is the centerpiece for Old Waverly’s English Garden. Inkster and Turner weren’t the only Handa Cup participants who did well in that U.S. Women’s Open. Canadian Lorie Kane, a member of the World team, should have some good vibes coming into this Handa Cap as well. She was tied with Inkster after 36 holes in 1999 and remained a contender on the weekend, though Inkster’s lead never dropped to less than three strokes. The U.S. takes a 6-1-1 edge into the ninth playing of the Handa Cup, but the World team won last year at Hermitage in Nashville, Tenn. Saturday’s schedule calls for best ball matches over nine holes in the morning and alternate shot matches over nine holes in the afternoon. The concluding 12 singles matches will be played on Sunday.